GCU takes a major step toward reverting to a non-profit university when its application is approved by the Higher Learning Commission. 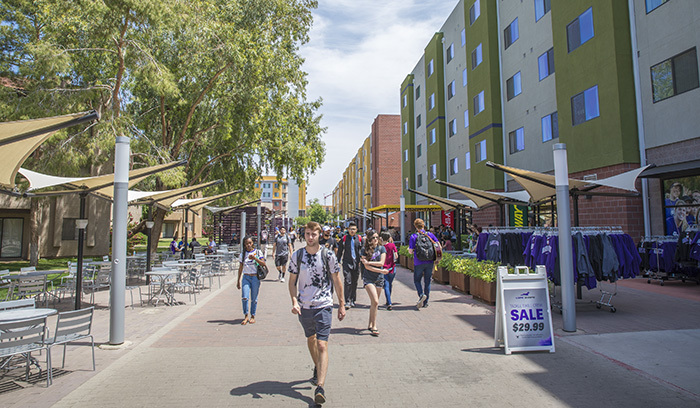 As part of the transition, expected to be completed by the end of June, Grand Canyon Education will sell certain academic-related assets to a non-profit entity that will carry the Grand Canyon University name. Following the sale, GCE will operate as a third-party provider of educational and related services to GCU and potentially, in the future, to other universities. Jerry Colangelo speaks at the gala to celebrate the opening of the museum in his honor. 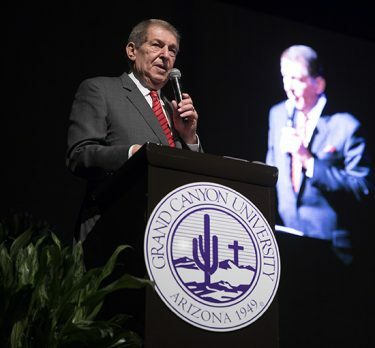 Friends, family and celebrities celebrate the opening of the Jerry Colangelo Museum, a tribute to the man who put Phoenix on the sports map and has been a major contributor at GCU. GCU’s pilot program assists the struggling Murphy Elementary School District in southwest Phoenix: Aspiring teachers help at Garcia Elementary, about 300 GCU students turn out at Serve the City to provide the Garcia campus with a new coat of paint and other improvements, and learning advocates (LEADs) from the Learning Lounge work with district students after school. As part of GCU’s commitment to innovate cybersecurity education and meet the growing need for experts in the field, the Arizona Cyber Warfare Range- Metro Phoenix opens at 27th Avenue and Camelback Road. The University also continues to expand its bachelor’s and master’s cybersecurity degree offerings. In its first shot at the Western Athletic Conference Tournament, the men’s basketball team comes up just short of qualifying for the NCAAs, losing to New Mexico State in the WAC championship game. Also, pole vaulter Scott Marshall (second team) and swimmer Mark Nikolaev (honorable mention) became the first GCU athletes to earn NCAA Division I All-American honors. The opening of the new baseball and softball stadiums is only the start of another highly constructive year. Also sprouting up, all on the east side of campus, are two more apartment-style residence halls, the new Colangelo College of Business building, a club sports center and a parking garage. 7. A decade of frozen tuition — cool! It certainly isn’t a surprise to any students who live here, but GCU’s campus is named the eighth-best in the country by Niche, a company that specializes in data on educational institutions. GCU finished just ahead of Stanford (ninth) and Yale (10th) in the 2017 rankings. The College of Doctoral Studies approves its 500th dissertation and also breaks its single-year record for graduates. The lucky No. 500 belongs to Melissa Beddow, a member of the College of Science, Engineering and Technology faculty. 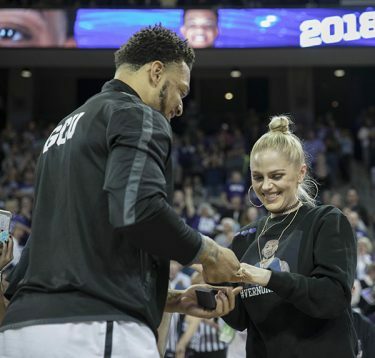 A little more than a month after GCU senior Levi Conlow draws national attention with his marriage proposal to Rachel O’Brien before a huge crowd of classmates in front of the Student Union, basketball player Keonta Vernon gets down on a knee to do the same with his girlfriend, Katie Peterson, during the team’s Senior Night at GCU Arena. Thank You GCU… Love You All! You’re The Best in keeping us connected and keeping us in faith. May the Good LORD continue to keep and guide us all. Are there any plans to build an aquatic center for swimming and diving teams?